This is an ancient Roman silver Siliqua of emperor Arcadius dating to 395 - 402 A.D.
VIRTVS ROMANORVM Roma seated left on cuirass, holding Victory on globe and inverted spear. This coin was minted at Milan (Milan, Italy), mintmark MDPS. 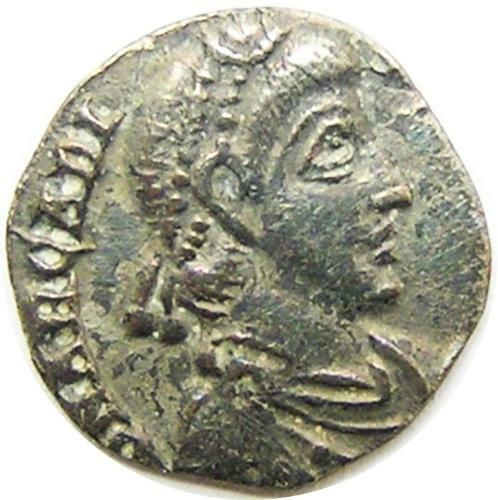 This coin would have been included within the last official shipment of silver to Britain before Rome abandoned all interest in the province in 410 A.D. As such many of these coins display clipping well into the Saxon period. DATE: 392 - 395 A.D.
PROVENANCE: Ex. Private Collection, originally found near Chippenham. UK.